This dress comes from Buffalo Gal Vintage, and it caught my eye on a quick prowl through the site. It's mustard gold, one of my favorite colors; it has scallops, one of my favorite shapes; and it has pockets, one of my favorite things. And … it's made of corduroy. What an interesting choice! I am always leery of corduroy dresses because, if you're not careful, you turn into one giant lint brush. A corduroy skirt, yes, of course; a corduroy shirt (especially in a pretty ditsy floral) is fine (you're a lumberjack and you're okay); a corduroy dress … eh. But this one is so cute! I may have to rethink my anti-corduroy-dress fatwa. Oh, yuck. I thought you were going to criticize the color, but instead you like it! Hmmm. I cannot think of another color I hate so much. And while I have that same dark hair of the model, I look like a very rotten egg in that color. Even MrAnonymous has a shirt in mustard and I have threatened to throw it away. I don’t even like it hanging next to the other shirts – it might rub off. (Have I said I don’t like that color? Hee. )That being said, I’ll give you that the dress style itself is pretty with the scallops. I just found your site yesterday through craftster.org, and I’m so excited! I L-O-V-E dresses of all kinds, and so I think your site is just wonderful. And I love mustard yellow/gold too! It’s rare to find someone else who didn’t hate the color of Michelle Williams’s Oscar dress this year. Keep up the awesome work! Cute photo except for the hair on top of her head and the corner of the house which look like it’s growing out of that dent. Very distracting. Anyway.I bought some beautiful, baby wale, mauve corduroy just yesterday. It was on sale and I am already anticipating Fall, with the cool weather we’ve just had. I thought I would make a long skirt and another of the jean jackets of which I have about 12 already (I am obsessed I know but the jacket is so wearable and comfortable and I like it, darnit). 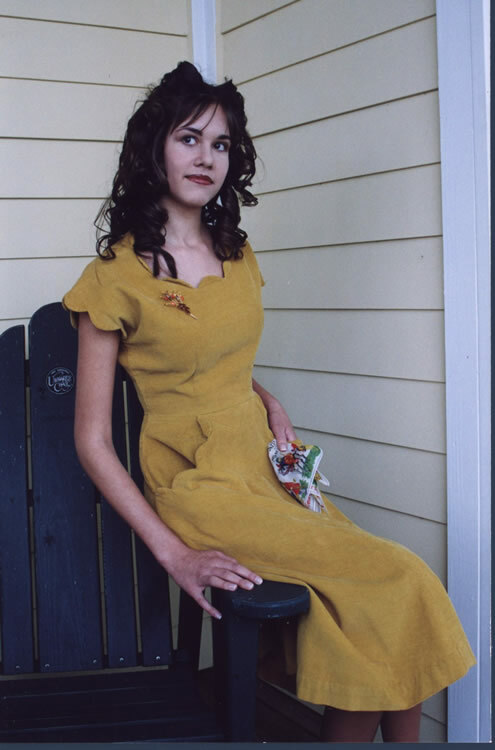 I know what you mean about the idea f a corduroy dress and I have never made one. I don’t think I’ll change my mind on the mauve corduroy but it’s something to consider for future reference. The other “problem” with corduroy is that it is difficult to put anything on top of it like a sweater – things stick to it. And even baby wale can be bulky.About the colour – whether you pronounce it properly (“mowve”) or the other way (“mahve”), it is an old-fashioned word and connotes an old lady image. However when you describe it as a pale purple tending toward the blue instead of the pink, the colour of an evening sky perhaps, then it sounds much more artistic. Ooh! You tickled my Canadian fancy! And I DO like corduroy shirts. I _love_ that dress, but it is too small for me, so sad. But I managed to find another, lovely, vintage wrap dress on that site that I fell in love with and bought. Once again, Dress A Day unites dresses with the women they need to be with! Thank you! In the late 60s I made a 2-piece top and skirt that has sleeves like that but no scallops on the neck. The scallops were on the bottom of the top and the bottom of the skirt. It was green corduroy that I made it out of and really liked it. I don’t have the pattern anymore (wouldn’t fit anyway!). Linda K.
Normally I detest mustard. However here it works. The scallops and the shape of the dress offset the normally stiff- and possibly-slightly-masculine quality that corduroy usually imparts. I might add, that splash page for Buffalo Gal–a bit of a challenge to take it all in. I don’t know where to look. Yikes. I once made a friend an ankle-length, voluminous, tiered skirt made of an incredibly soft, flowing baby cord with a small floral print on a warm dark green ground. The flowers were of various colours. The corduroy was all cotton. The skirt moves just beautifully when she wears it, which she still does. It’s a gorgeous thing. Almost floats.Never underestimate what cord can do! I have to agree with anonymous. I look like a rotton egge too in this color. I like everything else about the dress except the color it just won’t work for me. My dh looks great in all fall colors. This sometimes makes me very jealous. He even looks good in mustard. I love the color mauve. I have a muve wide wale cord skirt at my mamas. I would need to loose 3 inches off my waist before I could wear it again. I never got rid of the skirt because I was hoping to find some cord fabric that same color. My mama could also still wear the skirt if she wanted too.I have 10 yards of fushia baby wale cord upstairs in my bedroom. I don’t know what Im going to make out of it yet.When I hear the name mauve. I think of the 30’s. I have a 1930’s couch with the original mauve mohair on it. I do not think of an old lady when I hear mauve. I think of elegant, glamour or class.I do love corduroy jumpers. I wish they would come back in style. I will wear mine enven tho it’s not in style this year. i bought the dress!!!! 🙂 i’m a redhead, and this color makes me look ruddy and healthy. perfect size too. thank you for posting this, erin. much appriciated as always for the fabulous dresses!! Mimi takes the plunge! Well done! Now you could send in a photo of yourself modeling it! I was once adamently anti-blogs but after finding this site I must say that I’m reformed. I had no idea that blogs could be so useful or entertaining. I love this dress, and I love the color. Mustard has always made me feel rosy looking. I also love pockets and was surprised to find that others shared my affinity. Buffal Gal’s models are an amazing touch but my favorite feature is the thumbnails that allow you to complete an outfit.P.S. Did anyone see the gloves? Woo hoo Mimi!!!! Enjoy the dress. Woo and hoo to Mimi! Enjoy the dress!I love corduroy – specifically, either babywale or waleless corduroy (and waleless corduroy really isn’t velveteen; there’s still a difference). I have, waiting to get made up into various garments: a chunk of gold babywale corduroy (destined to be a jumper, aka a sleeveless full-skirted scoopneck princess dress, so I can wear it with or without a shirt or sweater, as the seasons dictate, low enough so that the gold doesn’t egglify my pale skin); a bolt of pale pink babywale corduroy (destined for dress-and-jacket); a bolt of red babywale corduroy (ditto); a chunk of green corduroy (skirt-and-jacket); a piece of babywale corduroy printed with various green leaves and little red flowers, gotten to go with a piece of green corduroy, and I realized that AFTER I made up that particular green corduroy for someone else)(Bolivian jacket variation); a chunk of really dark plum cordury with a scrolling floral vine pattern, destined for the princess jumper; two pieces of black courduroy printed in a pale mushroom paisley pattern printed with metallic gold (skirt-and-jacket); a piece of mauve corduroy (I, too, love mauve); a piece of copper and black corduroy with metallic accents in an Ottoman pattern, destined for a jacket … I love corduroy. I especially love printed corduroy, and it seems as if it might be a season where I can buy some. And a fitted dress in a babywale corduroy is not particularly bulkifying. I heartily recommend the sleeveless dress variation of jumper, as it extends the wearability, and a sweater or other layers can be worn under, rather than over, the corduroy. If you’re obsessive (not that anyone here is), a corduroy jumper with a blouse in a stripe or floral, with a matching corduroy jacket lined in the blouse fabric, is mighty appealing (well, to me it is, at least). Corduroy makes a nice casual counterpoint to the omnipresent denim, when other dress or skirt materials might seem too formal. And corduroy can make a wonderful floor-length robe for the fall/winter, especially if you make it with a fitted top and a long full skirt, like a wrap dress. The Butterick retro dress pattern in an earlier blog, the one where the back wraps around the front, would be a very nice choice for a babywale corduroy – and so would the Douro Dress Pattern! This isn’t bad at all. It looks very old fashioned and nice. I like mustard yellow, actually. Not so much into scallops, but it seems to have a nice fit. Reminds me of Dances With Wolves a little. Hope that isn’t seen as an insult, as I really think it’s plain but pretty.